← Character Contest 13: Kick it! Redwall, The Mice Templar, Mighty Mouse, Johnathan Brisby, Danger Mouse, Pinky & The Brain… ring a bell? Bueller? Security? Okay man, back off, I’ll quit telling your wife that I have a mouse in my pocket, I thought she was single, you can calm down dude. 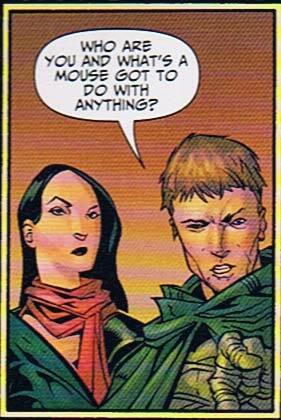 Actually, from the comic, that mouse was the Phantom Stranger! Everything. The mice have to do with everything. They know everything about you, your family, and the dude your wife’s leaving you for.